If you have already heard about the Magic Button, read on because the feature set has expanded by a factor of five. This post is to inform the community about the upcoming community release of the Magic Button software, as well as the upcoming availability of the new LumenVox Community Speech Licensing Server. The formal announcement, live demonstration (always interesting demonstration speech applications on a speaker phone with a microphone held up to the speaker) and details will be presented in Vegas in a week-and-a-half. If you are with the press and are interested in attending the event to see the Magic Button in action or would like to schedule an interview, please email me directly at ethan.schroeder at schmoozecom dott com. The Magic Button is an extensive speech recognition call management tool built on Asterisk and LumenVox speech recognition technology. It allows users to control their PBX experience with nothing more than their voice. Welcome to a brand new way to communicate. With the touch of the Magic Button, you can use your voice to control calls, set your away status, send and receive messages, call and page groups of people in your organization, and even ask what the date, time or weather is! You can initiate conversations with people in your organization, your customers or any telephone number. Just say “call John Smith”, “call extension one zero zero one”, “call extension one thousand one”, “call 5-5-5-1-2-3-4”, “call one-eight-hundred-5-5-5-1-2-3-4”, “Intercom John Smith”, or “Intercom Extension 1-0-0-1”. When you are on the phone with someone else, you can say things like “transfer to John Smith”, “transfer to extension 1-0-0-1”, “transfer to John Smith’s voicemail” or “park call”. Call parking allows you to put a caller on hold and pick that caller up from any phone in your organization. After parking a call, you will be told the parking slot the caller is in. If you forgot the parking slot, you can retrieve a list of parked calls by saying “list parked calls”. If you or someone else parked a caller in slot seventy-one, you or anyone else in your organization could say “retrieve call seven one” or “retrieve call seventy one” and be immediately connected to that caller. In addition, you can interact with call groups (ring groups), page groups, and voicemail blast groups. You can say “what groups can I page?”, “what groups can I call?”, or “what voicemail blast groups are there?”. Depending on the groups setup on your system, you can say things like “page all”, “page warehouse”, “call group sales”, or “leave a message for group sales”. Out of the office? No problem. With the Magic Button, you can assign a special inbound DID phone number or hidden IVR option to allow employees access to all Magic Button functionality on the road. Users login with their extension and voicemail password (using their voice), and become their extension and have full access to all Magic Button functionality. You can control your away status and even find out where other people in your organization are. If you are going to lunch, just push the Magic Button and say “I’m at lunch”. The Magic Button will prompt you if you would like to set a return time and record a temporary away message. Likewise, you can say “I’m away”, “I’m in a meeting” or “I’m out of town”. When you are back, just say “I’m back”. Asking “where is John Smith?” will tell you if John Smith has set an away status. If John Smith is away, you will be prompted with the option to be notified when John Smith is back. As soon as John Smith is back you will be paged and notified that John Smith is back and have the option of connecting to John Smith. One of the biggest hurdles to bringing speech recognition capabilities to small and medium business has traditionally been the cost of speech recognition ports on a phone system. In order to ensure non-blocking of service, you need to purchase enough speech ports to supply total possible concurrency. This would easily add 25% to the total cost of the solution to the customer. Initial cost is an issue no more! Through an arrangement between FreePBX, Schmooze Communications, Digium, and LumenVox, we are announcing a Community Speech Licensing Server. By pooling together hundreds (and eventually thousands) of licenses, we are able to provide speech recognition capabilities on an unlimited, non-blocking port model at low monthly per-PBX fees, while providing the rich applications like the Magic Button, voice-enabled company directory and voice-enabled auto-attendants (IVRs) as part of a low monthly service fee for access to the Speech Licensing Server. How low? How about $5-$50/month low, depending on the size of the PBX? Now we’re talking speech recognition that is affordable to any PBX customer. 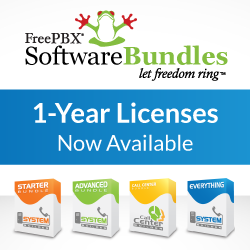 Your commitment to the Community Speech Licenseing Server also helps the FreePBX project, as Philippe has partnered with us to bring you this and future speech-driven applications that are easy to configure via the FreePBX interface.